The Brexit vote in 2016, the election of Donald Trump as America’s president, the rise of Matteo Salvini in Italy, and the enduring popularity of Russia’s Vladimir Putin have all made those on the liberal and center-left very, very worried. For these folks, all of these developments are portents of the end of democracy and the post-Cold War consensus. Edward J. Watts’s book Mortal Republic may be directly intended for this worried lot. 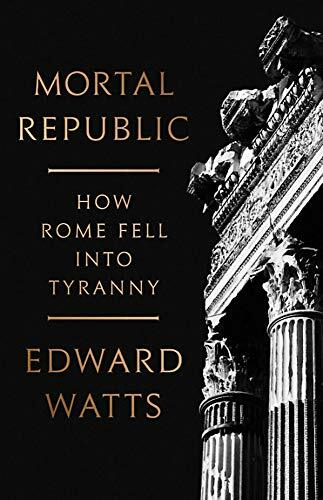 You see, Mortal Republic describes how the Roman Republic, which our nation’s Founding Fathers considered the height of human achievement, became the Roman Empire—despotic, corrupt, and anti-republican. Watts argues that three main factors weakened the Roman Republic’s civilization of virtue: 1) a rapid influx of money in the second century BCE, 2) the growth of the Roman army as a result of Rome’s predominance in the Mediterranean following the Second Punic War, and 3) the rise of a professional class of politicians who realized the power of the mob (the populares). Each one of these developments, Watts argues, fed into each other. For instance, once Rome successfully conquered the Italian peninsula, it quickly found itself as the overlord of Iberia and Greece. Both of these provinces proved rich in natural resources and slaves, and in Iberia, constant rebellions forced the Senate to headquarter permanent legions there. The Roman army had once been a citizens’ militia, but thanks to the early successes of the Carthaginian general Hannibal, the Senate realized that a professional military was necessary. This professional army required well-paid recruits or conscripts, many of whom had to be kept in line with promises of land and high wages, especially if they had to endure dangerous postings to Spain or North Africa. Given that the new Roman military machine of the second century BCE was composed mostly of plebeian troops, Roman politicians from both patrician and plebeian families recognized the incredible power that could be won if soldiers supported their cause. Hence, the Gracchi brothers, who came from a plebeian branch of the Sempronia family, utilized their connections to the celebrated general Scipio Africanus in order to agitate for land reform in Italy. The Gracchi brothers failed in their endeavors, but left behind a poisonous legacy of class warfare. Ultimately, a populare named Julius Caesar would inspire the collapse of the Roman Republic by promising Rome’s plebeians more bread and safety from civil war. Mortal Republic may present no new ideas about the fall of the Roman Republic, but it is a timely reminder that republics are precarious. The mass of citizens will revolt if they feel like the “game” is rigged against them, and when civilizations experience civil war or a rise in crime, many will gravitate to strongmen out of an understandable desire for security. This problem cannot be isolated to Roman history; populism comes from the Latin populare, and the word “dictator” is also of Latin origin. Dictators were once Roman generals granted emergency powers by the Senate during times of national emergency. But, as the canny Caesar proved, dictators can remain in power so long as they have the support of the plebeian or populist masses. Mortal Republic provides excellent insights into how the Republic became the Empire, and more broadly it speaks to the ever-present threat of centralized power. The more a civilization centralizes, the more powerful a central government becomes. A powerful central government will almost always give way to authoritarianism of one stripe or another. Mortal Republic shows that Caesarism awaits even the most resilient of democracies.